This product is a non-selective herbicide that will kill any vegetation contacted and will prevent re-growth for up to 3 months. It enters plants through the leaves and moves down to the roots. This will ensure that the entire plant is eliminated. It also provides a protective barrier that prevents weeds and grasses from emerging for up to three 3 months. Avoid direct spray or drift onto desirable plants, lawn grasses, shrubs, and trees. Protect desirable plants and vegetation with a piece of plastic or cardboard. If desirable plants are accidentally sprayed, wash plants with water immediately. 1. Remove cap and replace with reusable AccuShot Sprayer. Make sure sprayer cap is tightly closed before use. 2. Twist nozzle to adjust spray from CLOSE to SPRAY or STREAM . 3. When priming the sprayer, hold sprayer level to the ground. Sprayer may not prime if it is held at an angle. Once primed, it will spray in any direction. Keep reusable AccuShot™ Sprayer for use with Spectracide® Weed & Grass Killer with Extended Control2. This pesticide is toxic to aquatic invertebrates. To protect the environment, do not allow pesticide to enter or run off into storm drains, drainage ditches, gutters or surface waters. Applying this product in calm weather when rain is not predicted for the next 24 hours will help to ensure that wind or rain does not blow or wash pesticide off the treatment area. Do not apply this product in a way that will contact any person or pet, either directly or through drift. Keep people and pets out of the areas during application. 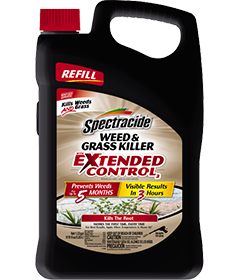 Spectracide® Weed & Grass Killer With Extended Control is pre-mixed and ready to use and is formulated for “spot” treatment of weeds and grasses. Use it on driveways and walkways or around fences, trees, flower beds, shrubs and other areas in your yard (except in lawns). One application of this product will prevent regrowth for up to three months. Completely wet the leaves of the target vegetation. Provides season-long protection from regrowth. Pesticide Storage: Turn the nozzle to “CLOSE” position. To prevent leakage, attach sprayer to clip. Store this product only in its original container in a secure storage area away from sources of heat or open flame and in an area inaccessible to children and pets. Keep from freezing. Pesticide Disposal: Do not discard the AccuShot™ Sprayer. Keep the AccuShot Sprayer for use on Spectracide® Weed & Grass Killer With Extended Control2. Nonrefillable container. Do not reuse or refill this container unless the directions for use allow a different (concentrated) product to be diluted in the container. CAUTION. Causes skin irritation. Causes moderate eye irritation. Avoid contact with eyes, skin or clothing. Wash thoroughly with soap and water after handling and before eating, drinking, chewing gum or using tobacco.